← Given Enough Time, Everything is OK.
My life is blessed with a handful of close friends who feel deeply and express their feelings openly. It is an honor to share my life with them. I never know when one of them will pass along a thought that will touch me. The morning I found the following Charlie Chaplin quote emailed from a new friend of about a year now (thank you P.!). I have forgiven mistakes that were indeed almost unforgivable. I’ve tried to replace people who were irreplaceable and tried to forget those who were unforgettable. I’ve acted on impulse, have been disappointed by people when I thought that this could never be possible. But I have also disappointed those who I love. I have laughed at inappropriate occasions. I’ve made friends that are now friends for life. I’ve screamed and jumped for joy. I’ve loved and I’ve been loved. But I have also been rejected and I have been loved without loving the person back. I’ve lived for love alone and made vows of eternal love. I’ve had my heart-broken many, many times! I’ve cried while listening to music and looking at old pictures. I’ve called someone just to hear their voice on the other side. I have fallen in love with a smile. At times, I thought I would die because I missed someone so much. At other times, I felt very afraid that I might lose someone very special (which ended up happening anyway). But I have lived! And I still continue living everyday. I’m not just passing through life and you shouldn’t either… Live! The best thing in life is to go ahead with all your plans and your dreams, to embrace life and to live everyday with passion, to lose and still keep the faith and to win while being grateful. All of this because the world belongs to those who dare to go after what they want. And because life is really too short to be insignificant. There are times I play the Shoulda, Woulda, Coulda” game. It’s unavoidable. Psychologists refer to this process of evaluating how I might have done things differently, as “counterfactual thinking”. More often than not it is a mechanism that conjures up feelings of disappointment and regret, at least temporarily. There is one good result that now usually follows a bout of ‘wishing backward’ thinking. Frequently I start the circle of thought lamenting missteps with ‘should have, would have, and could have’ been. But usually now I complete the loop being grateful for ‘what is’ instead of pondering what might have been. 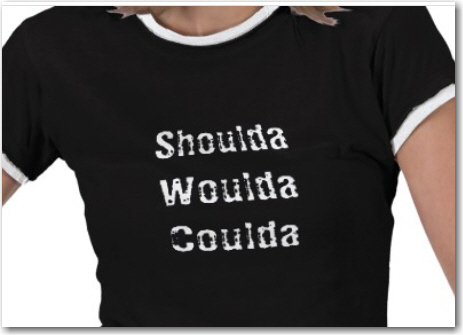 What has changed from how I used to react to “Shoulda, Woulda, Coulda” to my response to that type thinking today? One simple thing: I have learned to be grateful for all of my life. “All” includes not just what was positively wonderful and rewarding but also what was terribly difficult and challenging. Learning to be grateful for my mistakes was not easy. It took a long, long time before I grasped that my blunders and errors were frequently my greatest teachers. Gratitude tempers and beautifies everything it shines upon, even mistakes. for a might have-been has never been, but a has was once an are.